Scientists at Kavli Institute of Nanoscience at Delft University have built a nanoscale data storage device containing 1 kilobyte (8,000 bits) with a storage density of 500 terabits per square inch (Tbpsi) — 500 times denser than the best commercial hard disk drive currently available. Each bit is represented by the position of one single chlorine atom. “In theory, this storage density would allow all books ever created by humans to be written on a single post stamp,” says lead scientist Sander Otte. The research is reported today (Monday July 18) in Nature Nanotechnology. Every day, modern society creates more than a billion gigabytes of new data. To store all this data, it is increasingly important that each single bit occupies as little space as possible. In 1959, physicist Richard Feynman challenged his colleagues to engineer the world at the smallest possible scale. In his famous lecture There’s Plenty of Room at the Bottom, he speculated that if we had a platform allowing us to arrange individual atoms in an exact orderly pattern, it would be possible to store one piece of information per atom. To honor the visionary Feynman, Otte and his team have coded a section of Feynman’s lecture on an area 100 nanometers wide. Because the chlorine atoms are surrounded by other chlorine atoms, except near the holes, they keep each other in place. Which is why this method with holes is much more stable than methods with loose atoms and more suitable for data storage. The researchers organized their memory in blocks of 8 bytes (64 bits). Each block has a marker, made of the same type of “holes” as the raster of chlorine atoms. Inspired by the pixelated square barcodes (QR codes) often used to scan tickets for airplanes and concerts, these markers work like miniature QR codes that carry information about the precise location of the block on the copper layer. The code will also indicate if a block is damaged, for instance due to some local contaminant or an error in the surface. This allows the memory to be scaled up easily to very big sizes, even if the copper surface is not entirely perfect. This research was support by the Netherlands Organisation for Scientific Research (NOW/FOM). Scientists of the International Iberian Nanotechnology Laboratory (INL) in Portugal performed calculations on the behavior of the chlorine atoms. The advent of devices based on single dopants, such as the single-atom transistor, the single-spin magnetometer and the single-atom memory, has motivated the quest for strategies that permit the control of matter with atomic precision. Manipulation of individual atoms by low-temperature scanning tunnelling microscopy provides ways to store data in atoms, encoded either into their charge state, magnetization state or lattice position. A clear challenge now is the controlled integration of these individual functional atoms into extended, scalable atomic circuits. Here, we present a robust digital atomic-scale memory of up to 1 kilobyte (8,000 bits) using an array of individual surface vacancies in a chlorine-terminated Cu(100) surface. 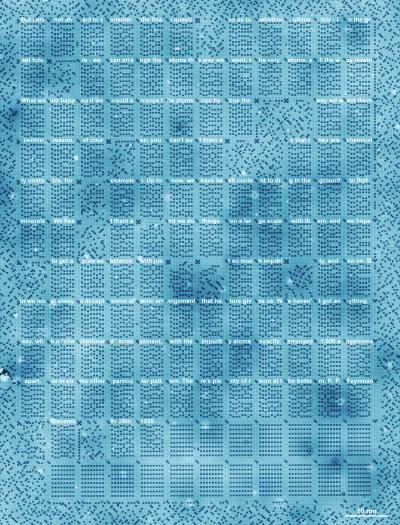 The memory can be read and rewritten automatically by means of atomic-scale markers and offers an areal density of 502 terabits per square inch, outperforming state-of-the-art hard disk drives by three orders of magnitude. Furthermore, the chlorine vacancies are found to be stable at temperatures up to 77 K, offering the potential for expanding large-scale atomic assembly towards ambient conditions.